Thomas Cromwell’s life has made gripping reading for millions through Hilary Mantel’s bestselling novels Wolf Hall and Bring Up the Bodies. But who was the real Cromwell? This major new biography examines the life, loves and legacy of the man who changed the shape of England forever. Born a lowly tavern keeper’s son, Cromwell rose swiftly through the ranks to become Henry VIII’s right hand man, and one of the most powerful figures in Tudor history. The architect of England’s break with the Roman Catholic Church and the dissolution of the monasteries, he oversaw seismic changes in England’s history. Influential in securing Henry’s controversial divorce from Catherine of Aragon, many believe he was also the ruthless force behind Anne Boleyn’s downfall and subsequent execution. 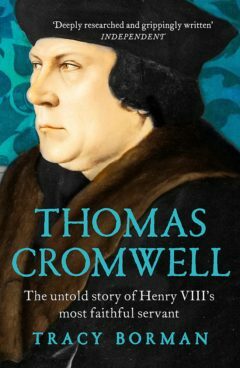 Although for years he has been reviled as a Machiavellian schemer who stopped at nothing in his quest for power, Thomas Cromwell was also a loving husband, father and guardian, a witty and generous host, and a loyal and devoted servant. With fresh research and new insights into Cromwell’s family life, his household and his close relationships, this book tells the true story of Henry VIII’s most faithful servant.